A big, trophy-class whitetailed buck. Few deer hunters realize the extent to which the habits and behavior of adult bucks are different from those of adult does, yearlings and fawns. 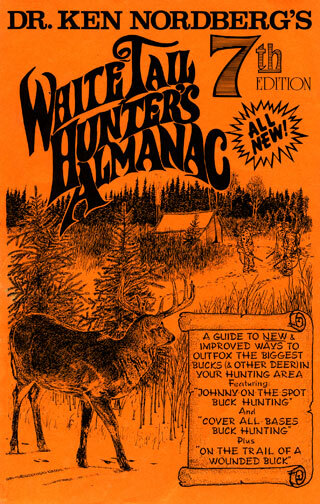 Except while breeding is in progress, hunting based on habits and behavior of much more commonly seen adult does, yearlings and fawns actually reduces the odds of fulfilling every whitetail hunter's dream, taking a big, unsuspecting buck at short range. Whenever an adult buck is your intended quarry, your hunting method must be adapted to whatever bucks are currently doing during the hours of the day such activities normally occur. You must think like a buck. Spring, summer and fall adult does, yearlings and fawns are members of small family herds. [Doe-family units.] Family herds divide and trade surveillance duties, one or more watching, listening and smelling for danger while the others feed, water or rest. While on the move a maternal doe commonly keeps her senses trained on a 90-degree-wide area ahead while her following young train their senses on each side and the rear. Though fawns and yearlings are not infallible sentinels and commonly make foolish errors while separated from their mothers (which is why fawns and yearlings make up more than 90% of the annual whitetail harvest), the more whitetail eyes, ears and noses there are in a herd, the more difficult it is for a dangerous predator or man to approach within 100 yards without being identified. This extra security tends to make the deer of family herds a bit less wary, less inclined to change their habits and behavior, abandon their ranges or become nocturnal to avoid danger. Though their home ranges overlap home ranges of maternal does and other bucks, adult bucks prefer to live alone. As loners, they must depend on their own senses and wiles to survive. They must therefore be more alert to sights, sounds and scents that portend danger than other deer; more skilled at avoiding discovery and threat from deadly predators and man. For these reasons adult bucks identify and avoid hunters at greater distances than other deer, and with far less provocation and more lasting consequences, they more readily abandon portions of or entire home or breeding ranges or they become completely nocturnal, in either case making them practically impossible to hunt. No matter how skilled you believe you are as a hunter, you play a major role in determining where adult bucks in your hunting area are located on any one day (the sites and trails they use) and the hours they are active. From the moment a super-sensitive buck first realizes you are a threat, which generally occurs during the first 1–3 hours after you begin hunting, that buck will not feed, water or bed without first making certain you are not near. Each time it discovers you walking, standing or sitting at ground level or high in a tree at any one site (today's older bucks are especially skilled at discovering humans in trees), which will occur twice daily until you take the buck if you're doing things right — keeping close — that buck will begin avoiding that site. 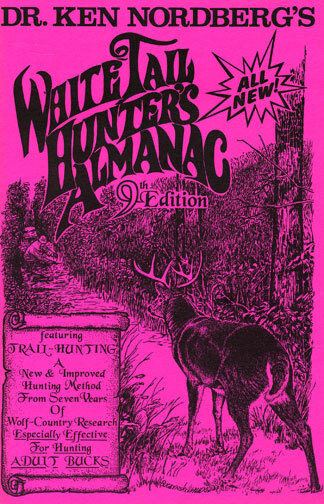 If upon discovering your near presence the buck is not alarmed enough to raise its tail, it will merely avoid traveling within 100 yards of that site for about a week if you are not discovered (via airborne scent) at that site again or for the balance of the hunting season if you are discovered at that site again. If alarmed enough to raise its tail, it will likely abandon its range and/or become nocturnal for a period of 5–10 days or longer. 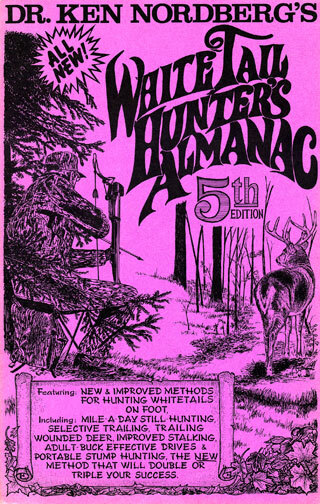 Whereas “never make 'em raise their trails” is not a firm rule when hunting “any legal deer,” it must be Rule-One when hunting adult bucks. Though self reliant, older bucks are not above exploiting other deer to avoid danger, especially at feeding areas also frequented by one or more doe family units and/or other bucks. The largest buck not uncommonly begins feeding much later than the other deer, watching the actions of the other deer from deep, downwind, perimeter cover for a considerable period before stepping into the open. Such a buck will then feed among or in the path of the other deer, allowing the other deer to perform all sentinel duties. If any preceding deer became alarmed enough to raise its tails, in which case its tarsal glands release readily-smelled, ammonia-like danger scent, which persists 24–48 hours, the buck in downwind cover will be amply warned. Upon cautiously retreating from the area, it will not likely return for a week or more. When hunting a feeding area known to be frequented by an adult buck, regardless of when other deer come and go, never give up hunting until at least an hour has passed since the last doe family deer departed (morning). 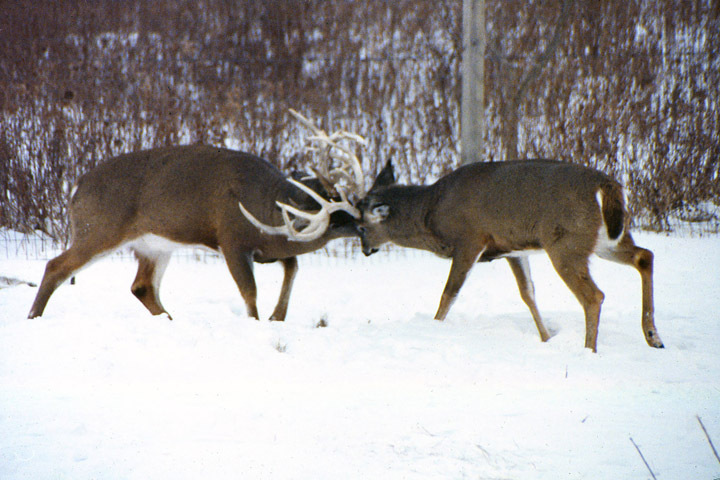 Two trophy-class bucks battling for dominance. The loser of this battle — while a worthy trophy — may spend most of its time during Phase III of the Rut — The Primary Breeding Phase — in a relatively small area of only 20–30 acres. During the antler-growing period (late April to early September), adult bucks generally feed alone within or very near their bedding areas. [Buck Bedrooms] From velvet shedding (early September) until 2–3 weeks before breeding begins (mid or late October), adult and yearling bucks (5–12) gather twice daily in favorite feeding areas to gorge on greens and spar or battle to establish their local pecking order. Lesser adult bucks (some large enough to be record-book bucks) temporarily settle in 20–30 acre areas not claimed (regularly patrolled) by dominant bucks, there making and renewing daily the musks of ground scrapes and antler rubs along the few deer trails generally present, feeding along the way. During this period and while breeding is in progress, most of these bucks are likely to be spotted on their scrape trails before 11AM and after 3PM. While the first two-week period of breeding is in progress, dominant bucks almost constantly accompany does in estrus. Though they feed very little during this period, they closely follow less-affected does throughout their favorite feeding areas early and late in the day. Most breeding occurs in doe bedding areas, the breeding pair wandering restlessly about these 10–40 acre areas throughout midday hours. To take dominant bucks during this period, the hunter must key on downwind perimeters of doe family feeding and bedding areas during appropriate hours. While breeding is in progress, dominant bucks are unable to patrol their breeding ranges and renew the lesser-buck-repelling musks of their ground scrapes and antler rubs. As musk odors wane, some lesser bucks will return to former home ranges, upon which they will be attracted to any nearby doe emitting irresistible doe-in-estrus pheromone. Though lesser bucks rarely have the opportunity to breed under such circumstances, their presence can be a plus or a minus for hunting. Whereas dominant bucks under the spell of doe-in-estrus pheromone are characteristically inattentive of sights, sounds or scents that portend danger, they are generally well protected by does in estrus and their fawns and yearlings. Other bucks in the area, generally forced by a now very dangerous dominant buck to keep 50 yards or more away, also make very attentive sentinels. Whereas it is virtually impossible for a hunter to remain undetected when approaching a group of deer thus engaged, a hunter sitting without motion on the downwind perimeter of the doe's bedding area has an excellent chance of taking a very large buck. Within 24–48 hours after does no longer emit pheromone, dominant bucks return to their bedding areas for a week or so of much-needed rest and lesser adult bucks return to their former home ranges. During this period, bucks generally feed near their bedding areas, not uncommonly with or in paths of the nearest doe family units, using them as sentinels. During the brief periods unbred does experience estrus over the next month or so, adult bucks repeat activities described above. Because bucks do not generally attempt to maintain exclusive breeding ranges after November breeding, several adult bucks are likely to be seen accompanying a doe that experiences estrus in December or early January. Adult bucks do many other things that make them much more difficult to hunt than other deer. For one, they bed in small (1–5 acres), out-of-way places within 100–200 yards of water, unlikely to be discovered by humans following more obvious deer trails. Characteristically, dense, woody cover that is impossible to move through without making considerable noise (providing early warning) surrounds their bedding spots, and in hilly or intensely farmed regions, adult bucks typically lie where they can spot and size up potentially dangerous creatures over considerable distances. Though they occasionally use the well-worn trails made and maintained (frequently traveled) by doe family deer, adult bucks prefer less-worn trails coursing through cover more dense than that considered “dense enough” by doe family deer. Being loners, even the most traveled of their favorite trails show little wear and are thus routinely overlooked by human hunters. Once adult bucks realize they are being hunted by one or more humans, they adapt in ways that make them even more difficult to spot. They cling to cover in which they are difficult to see more than 50 yards away. They travel off-trail more than 50% of the time. 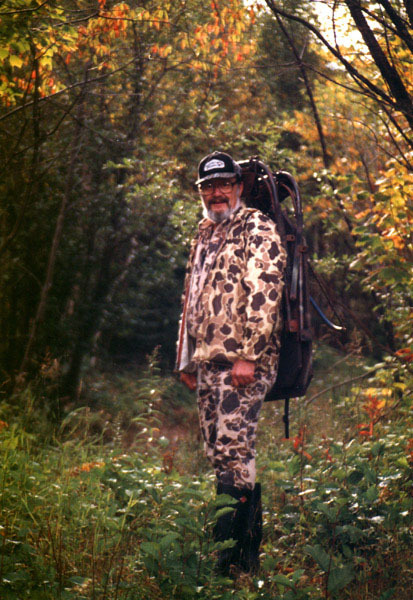 Wherever a human hunter is discovered (typically happening without the hunter's knowledge), they thereafter detour around the site, maintaining a safe distance of 100 yards or more. 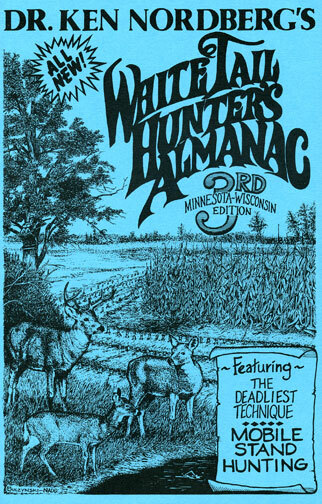 To effectively counter such precautions, the hunter must hunt in dense cover, forsaking trails, hunt downwind perimeters of feeding and bedding areas where adult bucks spend more than 90% of their time and move 100 yards or more to a new stand site every half-day, thus always hunting outside of areas being avoided by bucks. Hunted adult bucks reduce daylight movements during periods of moonlight. When there is moonlight in the morning, they head back to their bedding areas very early, typically within 30–60 minutes after sunrise (unless with a doe in estrus). When there is moonlight in the evening, they typically remain bedded until sunset. The odds of taking an adult buck are always best during the dark of the moon, and in periods of moonlight, during the first legal shooting hour of the day — from one-half hour before to one-half hour after sunrise. To take full advantage that first hour, be seated at your stand site no less than one hour before sunrise. The greater the velocity of the wind or the greater the amount of rain or snow falling, the more difficult it becomes for whitetails to identify and avoid dangerous predators and man. Winds 5–15 mph reduce feeding time during daylight hours 30–60 minutes, and winds exceeding 15 mph and/or moderate-to-heavy precipitation will keep most adult bucks in their beds during hours they normally feed, patrol breeding ranges or maintain ground scrapes and antler rubs. Feeding and breeding-related activities are also sharply curtailed by certain extremes in temperatures. 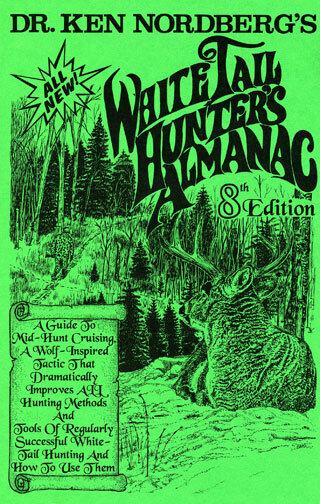 Unseasonably warm temperatures in late October and early November when whitetails have warm winter coats will bring a halt to making and renewing ground scrapes and antler rubs. Under such conditions, hunt feeding areas nearest buck bedding areas early and late in the day. Few whitetails will be active (except breeding pairs) while the temperature is less ten-above-zero — the temperature at which sap freezes, causing trees to pop. Whatever the current breeding-related activity, adult bucks are likely to be active (on the move) all day long when the weather is as follows: 1) while the wind is calm and the temperature is 20°F. to 40°F., 2) following two or more days of frigid winter weather while the wind is calm or light (less than 5 mph) and the temperature is nearly 32°F. (a near-thaw) or 32°F. or above (a thaw) midday or 3) while the wind is calm or light and precipitation is light — fog, mist, drizzle, light rain or light snow. 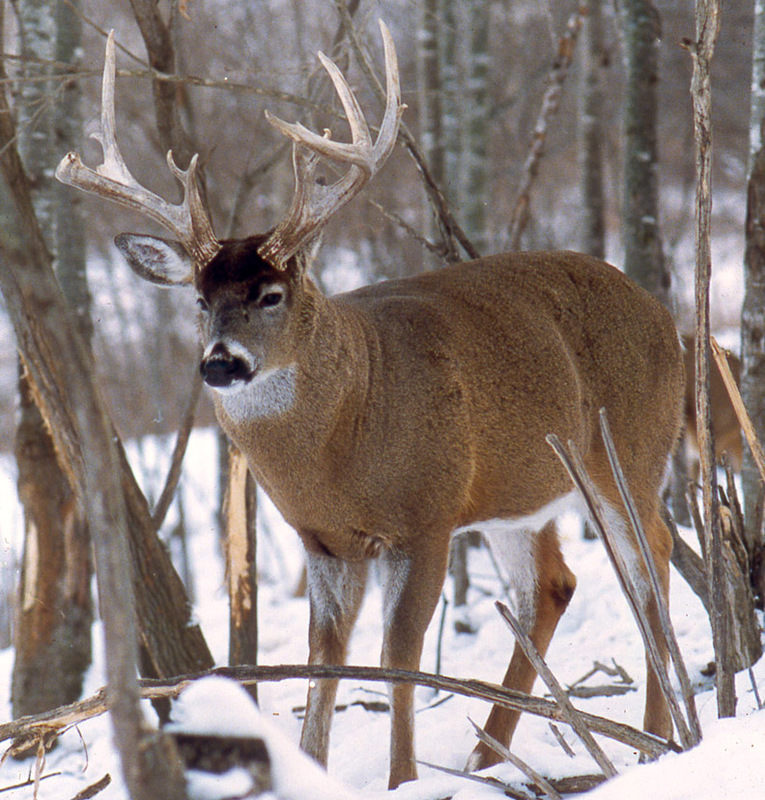 Whenever strong winds, moderate-to-heavy or any amount of sleet causes whitetails to skip a feeding cycle, within minutes after the weather eases up or ceases, unless the next feeding cycle is due to begin within 1–2 hours, every adult buck in the woods (and probably all other deer) will be on the move, feeding, during the next 1–2 hours. 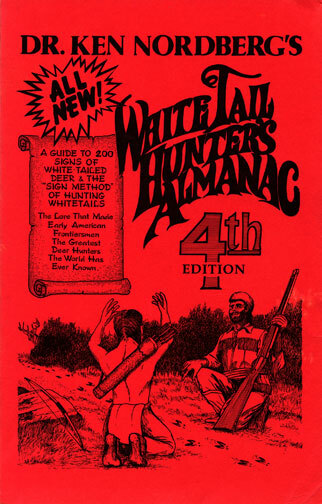 Though doubtless the adult bucks you personally hunt only escape certain doom via extraordinary luck, you can now explain to your hunting partners who sit in trees near well-worn deer trails why they do not often see adult bucks.